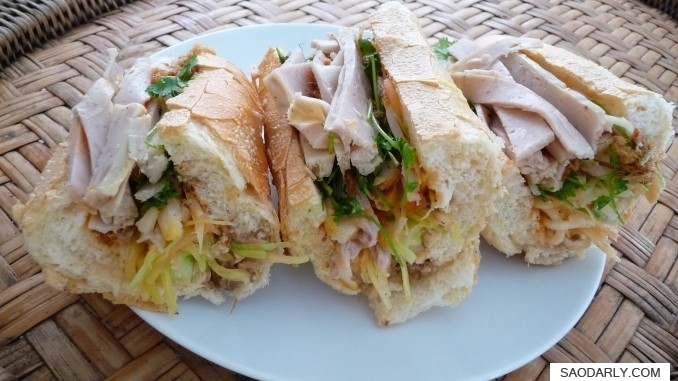 My typical breakfast in Vientiane, Laos is no other than Khao Jie Pate aka Lao baguette or Lao sandwich. 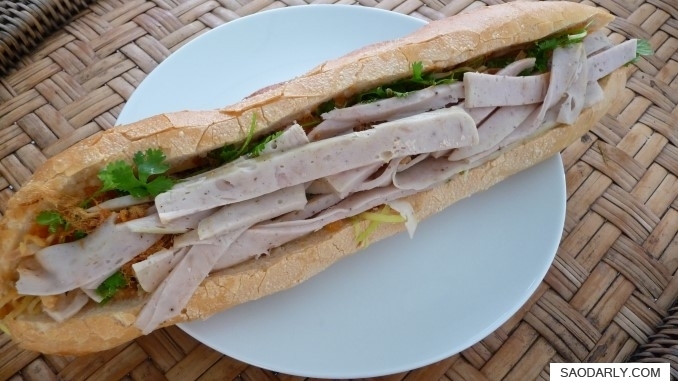 For less than two dollars, one baguette filled with meat, herbs, veggies, and spicy sauce dressing is enough to feed three people at my aunt’s house. There is no place in Holland that I can find such a delicious breakfast. When I do go to Laos, I eat this at least once a week for breakfast. Wow, you show so many wonderful aspects of Laos, and your beautiful photos of Lao food is making me hungry! We are going to visit Laos (leaving our home in New York on September 7th), and we will be in Vang Vieng for a couple of days. I saw your wonderful video on Youtube of the boat ride at sunset on the Nam Song River, and if you would email me contact info for the boat company, I’d greatly appreciate it, as we’d love to take the same ride. When you are in Vang Vieng, just head down to the boat landing area and you’ll be able to take a tour during the operating hours. It is a community run tour with boats on both sides of the Nam Song River. The drivers are like taxi drivers taking turn to service the tourists. It is also nice to do the tour in the morning as well. I did the morning ride as well as the sunset ride. Enjoy your time in Laos. It is beautiful this time of year with lots of greens if you don’t mind the rain that is.